How do you communicate the importance of recovery to your athletes and how do you monitor your athletes’ recovery? “To communicate the importance of recovery I chat to my athletes about the physiological process of adaptation so they have “buy in” to easy sessions, days off, walks, yoga and taking it easy. Tying this into a conversation regarding the ins and outs of how TSS (Training Stress Score) and TSB (Training Stress Balance) work also helps. As part of their workout description in TrainingPeaks I also suggest recovery protocols such as legs up the wall, recovery boots or infrared saunas. This helps keep them accountable. 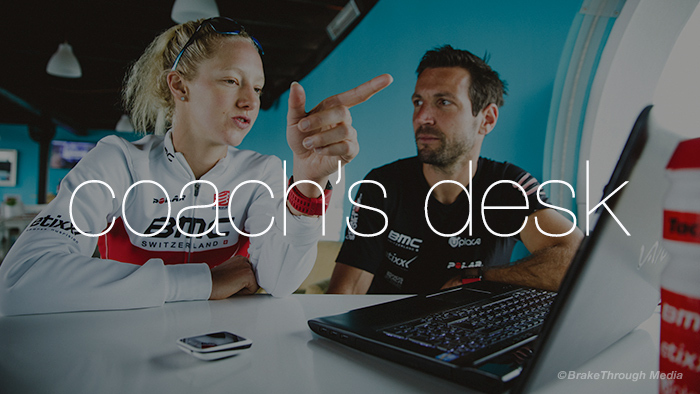 I monitor their recovery through metrics and the performance management chart (PMC) in TrainingPeaks, while also “listening” to their workout comments. For those that utilize HRV (Heart rate variability) I find this a very useful tool to monitor fatigue, illness and recovery. “People who seek my personal coaching services are driven, high-performance human beings in nearly all aspects of life. I usually begin my discussion on recovery with the fact that resting is often counterintuitive for high achievers, and I understand that. I ask each athlete to trust me for about six weeks so we can both see the benefits of a training plan that includes planned stress and recovery. In that time I have key workouts I use to look for quantifiable results in one or more categories. Examples include improved power over six weeks, specific power numbers on key workouts, faster speeds or lower heart rate cost for a given speed. “Having a strong element of trust between your athlete as a coach ensures that you can work with the athlete to enable recovery in their training. In the fast-paced world of amateur athletes, finishing a session usually leads straight to picking up the kids, going to work, being with the family or all the above. This often means that recovery doesn’t happen “by the book.” We need to work out smart ways to help that happen. In many instances, looking at the lifestyle as a whole and not just the training aspect will result in a better allocation of recovery time. This will result in a more balanced athlete and a more content one. Technologically: HRV, sleep, PMC, testing heart rate, etc. Qualitatively: sleep quality, RPE, “feel good factor,”mood, fatigue, etc. Responsively: training KPI’s, trends etc.